Meaning “remembrance”, Souvenance, is the Tunisian oud master’s new album after a five year gap following quartet recording The Astounding Eyes of Rita also on ECM that also featured Gesing and Meyer. In reuniting his former colleagues, Brahem has written a commanding and all embracing set that seamlessly captures and portrays emotions ranging from despair to joy, and pessimism to optimism that shows a real depth of vision. It is because of the scope and depth of the music, that I am glad I have waited to write this review and spent time just listening to the music. Sometimes with pen in hand ready to write the occasional prompt or note to myself, but more often to just savour the oft calm and serene and always beautiful music that is so easy to lose oneself in. Even now it almost seems that by trying to put into words what Brahem has so majestically conveyed in music, that I am souring the purity of the experience of listening to this album. Running over two discs, the music is hard won for Anouar. 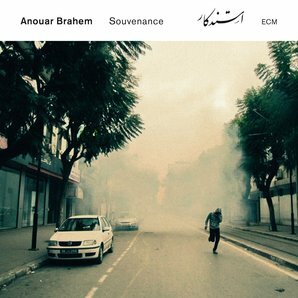 Firstly the music was begun at a time of great political upheaval in Tunisia, and such was the emotional turmoil Brahem found that the climate was not conducive to writing music, and put the project on hold. Resuming sometime later, whilst there are no direct link between these events in Tunisia, the mood of the time seems reflected in the finished work. Furthermore, Brahem’s points of reference where slim, having studied and concentrated on his own traditional music he had not written for strings before, and therefore he enlisted the help of Austrian composer, Johannes Berauer to work with on the orchestration. Episodic in nature the music has a quiet considered logic, with disc one having an overall more brooding and contemplative feel and disc two an underlying optimism; although within this framework there is considerable scope for contrast with the intense rhythms and declamatory bass clarinet from Gesing on ‘Deliverance’ and the tender and lyrical ‘Yousef’s Song’ on first disc. This contradictory scene is also played out on disc two in the rhythmic impetus that kicks in half way through ‘On The Road’, and the lovely feature for the leader’s oud and the strings on ‘Kasserine with the gentle accompaniment from Couturier. This is a wonderful album and Brahem should be congratulated for bringing together such passion and emotion in a set that for all its serenity speaks volumes.